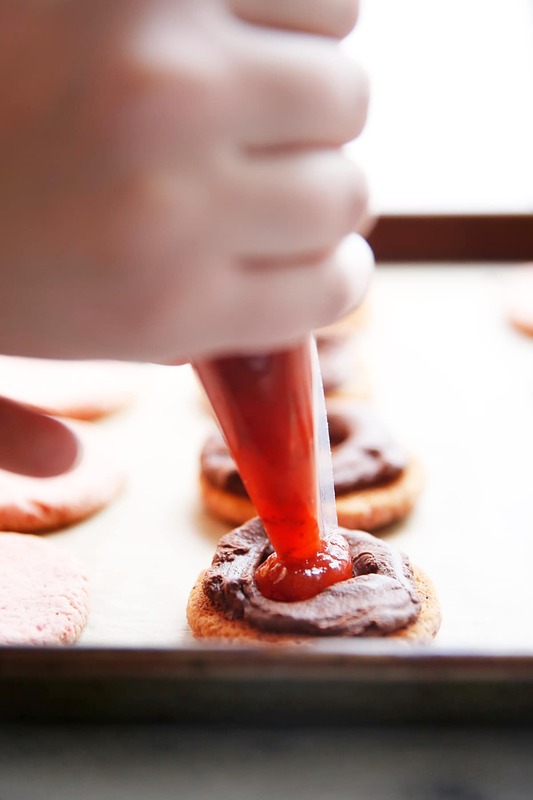 These Strawberry and Chocolate Ganache Sandwich Cookies are the cutest sweet treat, made even nicer because they are optionally free of the 14 most common allergens. Gluten free strawberry cookies are sandwiched between a dairy-free chocolate ganache with hidden strawberry jam in the middle. Made in partnership with our friends at Enjoy Life Foods. 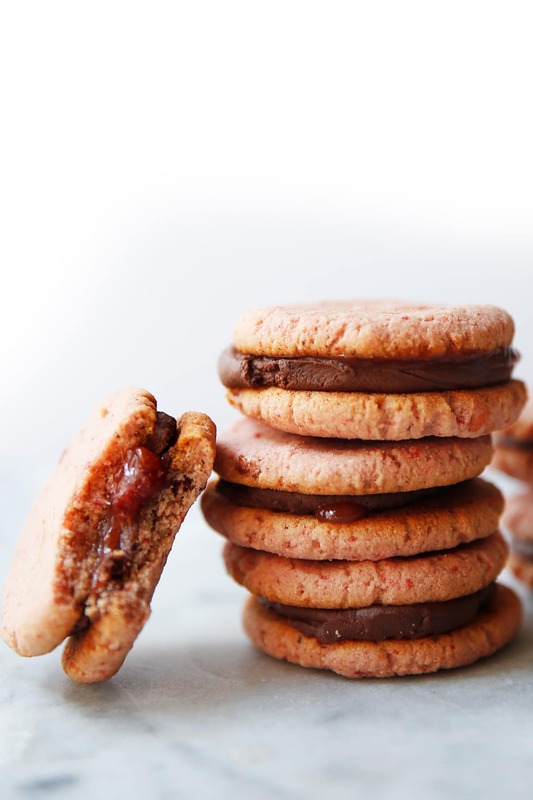 These Strawberry and Chocolate Ganache Sandwich Cookies are magic! They almost taste like a nut-free macaron and they have an amazing strawberry flavor that is complimented so well with the chocolate ganache. They are coming just in time for Valentine’s Day too–the perfect sweet treat to share on this love-filled holiday. These sandwich cookies are made even sweeter though because they are free of the top 14 most common allergens, including nuts and dairy! That means these little cookies are also school safe–making them the perfect treat to pack away for your kids to share with friends! Or really, just a treat for yourself. You deserve it! 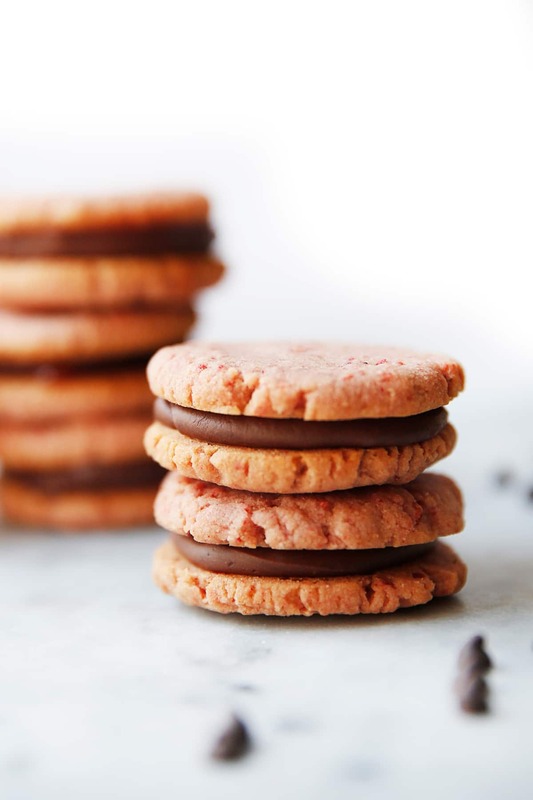 So let’s unpack what’s going on with these cookies: There are two strawberry cookies sandwiched with dairy-free chocolate ganache and a hidden center of strawberry jam that balances the whole thing out. There are a few steps needed to complete this recipe, but there isn’t anything hard to do! We use an electric mixer to make the cookie batter, but this doesn’t take much time. You can use either coconut oil or butter, and we enjoyed both versions equally. You’ll want the coconut oil to be solid at room temperature, and the same with the butter. It only takes a few minutes for the batter to come together, but once it does you’ll need to let it rest for about 10 minutes while the coconut flour hydrates, until it is no longer sticky. Once it has rested all you need to do to form the cookies is scoop out a tablespoon sized amount of dough, roll it into a ball and pat it out to a 2″ circle on a parchment or silpat lined baking sheet. We tried a couple of different methods of making the circle completely round but found that patting it out was the easiest. The cookies won’t spread, so don’t worry about spacing them out very far apart and they should all fit on one standard size sheet pan. While the cookies are baking you can make the ganache. Making a ganache is simply heating up a milk and pouring it over chocolate! 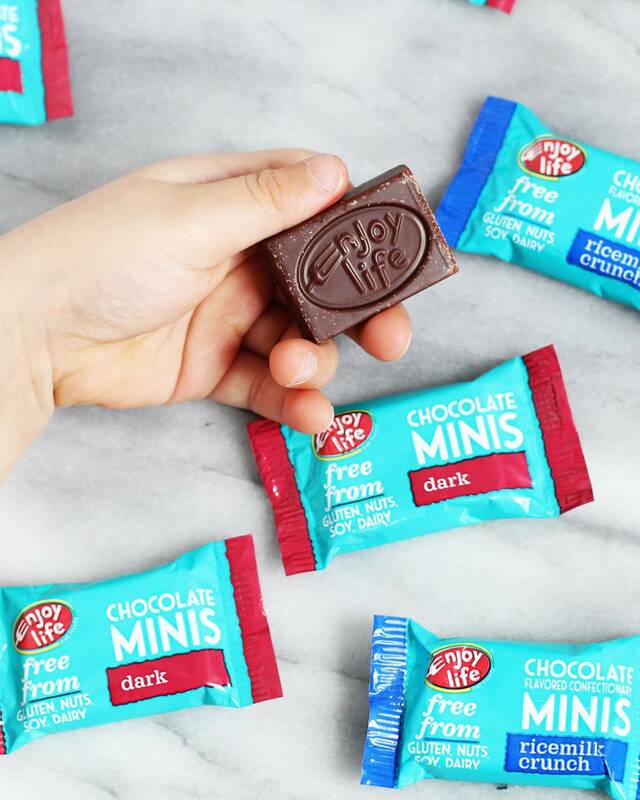 In this case we are using coconut milk and our favorite dairy-feee chocolate Enjoy Life mini chips which melt really easily and create a decadent ganache. Once the cookies are cooled you’ll pipe a small circle of ganache on half of them, with a little hole left in the center for the strawberry jam to go in. We used piping bags for this, but you can just as easily use a plastic bag with a small hole cut out of one of the corners, or even just place a tablespoons sized amount of ganache in the middle will work. We wanted to make these Strawberry and Chocolate Ganache Sandwich Cookies free of almost of the allergens out there so that they were able to be an inclusive Valentine treat for everyone, regardless of allergies or intolerances. This is especially relevant for school as there can be a lot of restrictions on what can be brought in. 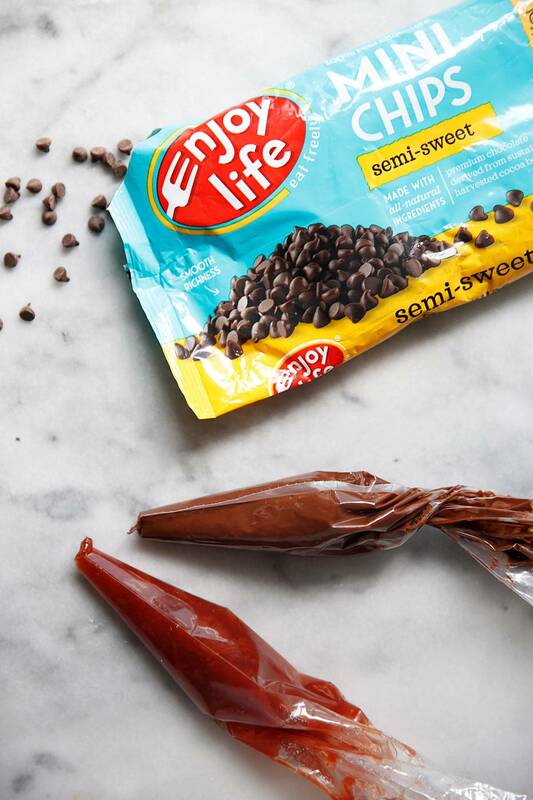 And this is why we love the chocolate from Enjoy Life! Enjoy Life baking chocolates are certified gluten-free, free-from 14 common allergens, verified Non-GMO, certified kosher, AND certified vegan and paleo-friendly, which makes them so inclusive for many different types of dietary restrictions. This month they’ve also launched the NEW Valentine’s Day Chocolate Minis! They would be a great option to bring into school and are the perfect size to share. They come in Dark Chocolate, Ricemilk Chocolate, Ricemilk Crunch (our favorite), and a variety pack. 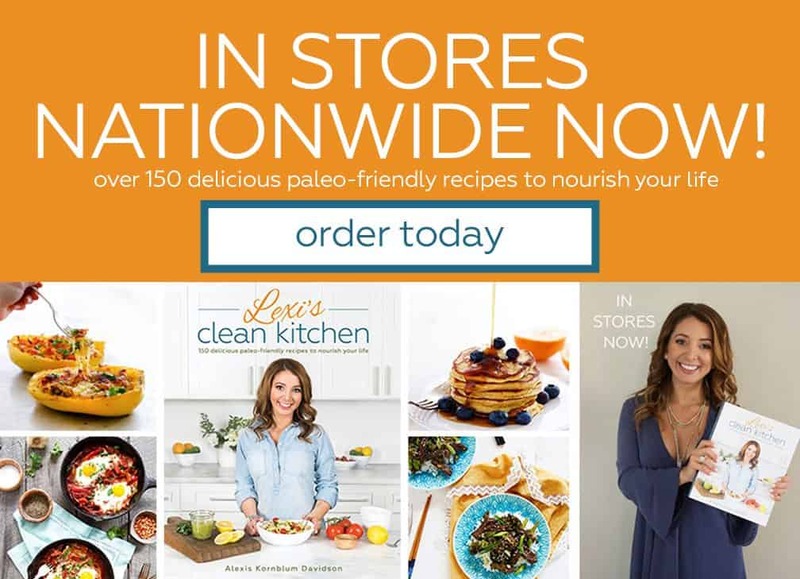 You can buy them right online here! We’ve been lucky enough to have been snacking on them this week, and they’re delicious! And as you can see below, they are also kid approved! Preheat the oven to 325ºF and line a sheet pan with a silpat or parchment paper. 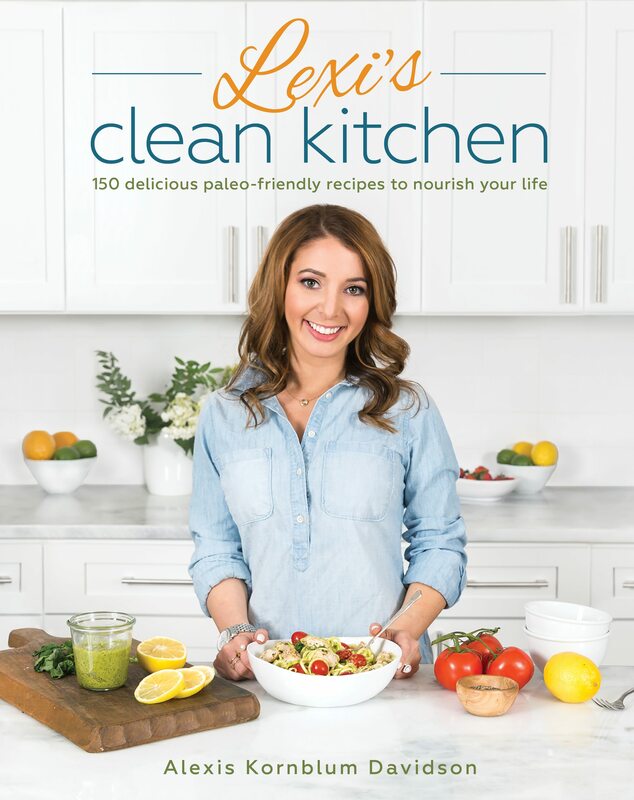 With an electric mixer, mix the coconut oil (or softened butter) and maple syrup until combined, about 1 minute. Add vanilla, almond extract (if using) and salt and mix until combined, 30 seconds. Add in coconut flour, tapioca flour, and strawberry powder. Mix until combined. Let rest for 10 minutes until the dough has stiffened up slightly (see note). Scoop out a tablespoon of dough and roll into a ball. Place on the prepared sheet pan and flatten slightly with your fingers to form a 2" circle. Bake for 12 minutes on middle rack. Place Enjoy Life Mini Chips in a small heat proof bowl. Whisk the chocolate and coconut milk together until a smooth ganache is formed (see note). Let it cool at room temperature until it has thickened up and no longer hot, about 20 minutes. Place the chocolate ganache in either a piping bag or in a plastic storage bag with a hole cut out of the corner of it for piping. Place half of the cookies with the bottom side up (the tan side). Pipe a circle of ganache on half of the cookies, living a space in the middle. Place a teaspoon strawberry jam in the middle. Place another cookie on top and gently press together. Best served the day they are made. Store in the refrigerator in a airtight container for 2 days. To make your own strawberry powder simply crush freeze-dried strawberries until they are a powder. We found this easiest to crush the strawberries in a big with a rolling pin. It’s ok if the strawberries are not a super fine powder. The almond extract enhances the strawberry flavor of this cookie. To make this nut-free omit the almond extract, as it is not essential. We like to weigh our coconut flour as a measurement that is over or under can make a big difference since coconut flour is so absorbent. 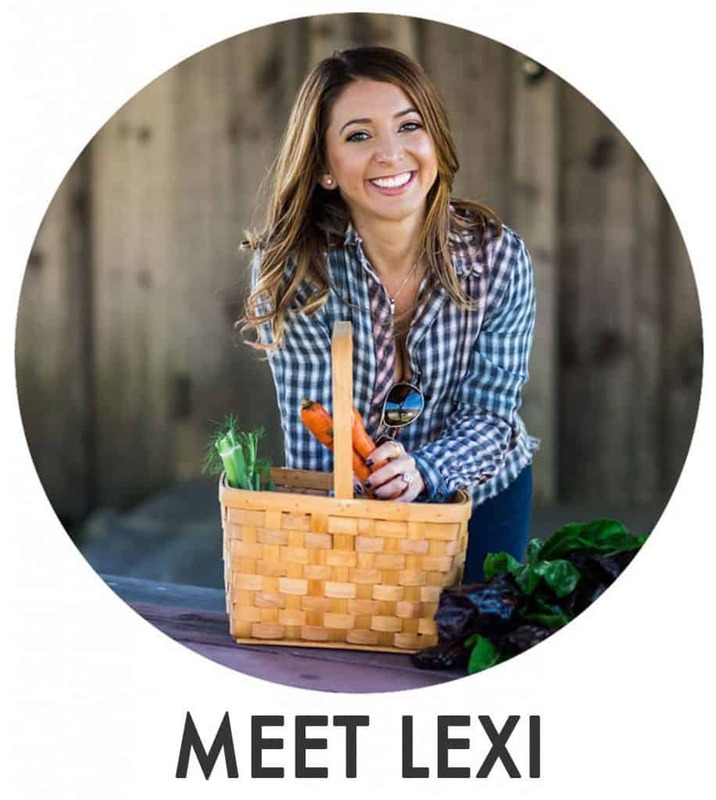 So if you have a digital scale at home, use it here! The cookie batter will seem like thick frosting at first, as the coconut flour needs time to thicken up. If you'd like to make your own jam, check out this post. If the ganache isn't coming together it's because the coconut milk hasn't been heated up enough. You can gently heat the whole mixture until the chocolate is melted enough, either over a double boiler or gently in 15 second intervals in the microwave. If your chocolate ganache ever gets too cold for piping you can gently rewarm it it over a double-boiler or in the microwaves for 10 seconds at a time. If the cookies are kept longer than a day they will soften up. They're still delicious, just a slightly different texture than when they are freshly made. I love the surprise in the middle of these. So yummy! Definitely winning the cute factor!! Best thing about sandwich cookies is you get TWO cookies in one. Love love love. And that filling is so good! Perfect for Valentine’s Day! OMG yes, need that! Love the enjoy life chocolate chips! These are so good!! I used vegan butter and they came out delicious, the flavors combine and it’s like an explosion of deliciousness in your mouth!! I put the ganache in the fridge for about 15 minutes to speed up the firming up process- just checked occasionally to make sure it wasn’t too cold!! Such a fun treat! !